Showing results for tags 'embroidery software'. How hair of animals and feathers of birds machine embroidery designs is imitated in editors of embroidery so that they looked nationalistically? In fact, there are 2 ways with which it’s possible to go in attempts to reach the necessary result: 1. 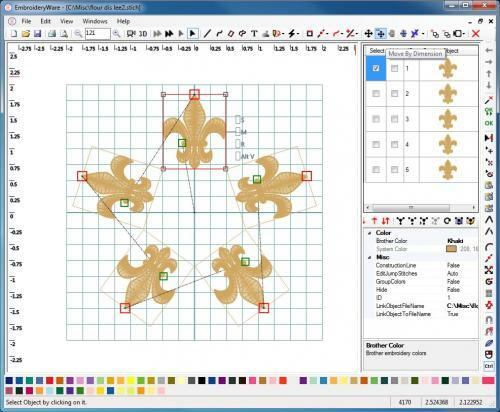 To create all objects manually, using traditional methods of a digitizing. 2. To use the automatic effects, similar "Fur" which allow, from the point of view of developers, quickly and effectively to make that becomes hands. Opportunity to apply this effect is far not in all embroidery software editors. It is in Tajima DGML by Pulse of 14 versions and in my Stitch Era Liberty Plus. I am more while anywhere anything similar didn't meet. But I after all not saw everything the editor so, quite probably, somewhere else such "the fast button" too exists. But before using automatic opportunities, I believe that it is worth paying close attention and to deal with how wool is created in manually mode. And to start something doing in the computer, in my opinion, it is necessary from far away, having addressed to bases – to hand embroidery. It’s lower than two most excellent examples of hand embroidery from the book A-Z of Thread Painting: And it already diagrams to them with division into sections and the ornamented direction of a stitch which correspond to the real direction of growth of wool and feathers: A method which authors of this book suggest to use is the most traditional - a combination of a long and short stitch with careful selection of mixed thread colors: Something similar at manually input of contours also is required to be repeated in the machine embroidery editor . Only it will be necessary to be played a little more with settings of parameters – density, stitch length, and also to apply still some effects which will help to mix up to colors of an embroidery, type of fragmentary edge (jagged edge) or will help to set the direction of natural growth of wool – tatami filling on the 1st or 2nd curves. That’s, in the course of digitizing it will be necessary to try to create something similar: Process of creation of such objects is simple and quite realize in any of editors of machine embroidery, after all its creation requires only a standard tool kit: sateen (satin stitch), tatami, simple stitch. It will be long and dreary process. But, it for 100% pays off that all parameters can be supervised thus: both density of layers, and stitch lengths (that is the extremely important for high-quality mixing of colors of threads), and a form of edge of object, and degree of its roughness, and the sizes of elements and the directions of stitches in them. That you won't tell about automatic methods about which I will tell later. Has anyone else upgraded to DG16 Maestro yet? For convert and resize this embroidery design you can using this free FREE embroidery converter by Wilcom True Sizer: . . Question: For some reason this will not completely install and I've tried several times. I'm using windows 10 with 4 core processor and 8 GB of ram and over 400 GB of free space. I have No issues downloading other programs so it must be some sort of problem with the program I believe. I hope someone else can confirm this. Support answer: Please try the following: 1. Clean up all temp folders. In an explorer’s address bar type %temp% press enter. Delete all files that are allowed to be deleted. 2. Go to C:\windows\temp Delete all files. 3. Disable you antivirus software and try to make a new installation. Japanese girl with cats machine embroidery design New embroidery design work. Wilcom software screen shot. Design very big and have many elements (embroidery block) of embroidery. I just purchased the PE-DESIGN NEXT embroidery software...now that I created a design to embroider- how do I send the embroidery design to my embroidery machine? Who uses this function in the program. share experiences. I can not understand the operation. All can be saved in one file? Each design or separately? How to automate this work. What can you change? Original text by: Lisa Prass So, you have created or downloaded a machine embroidery design that does not fit you hoop. Now, to embroider the design, you should take a series of actions to split it. In this lesson I will show you how to split a design, how to add the alignment stitches and crosses, and how to save it into two different files, using a "Stitch" machine embroidery design in Photostitch technique as an example. The process includes several basic steps... Splitting a design: creating and positioning of the hoop Using the Rectangle tool, create additional objects that will imitate your hoop. Place them in the embroidery area so that your machine embroidery design would be within these virtual hoops. If you don't like what you see, change the position of the hoop until you will achieve the result you want. The hoops for which you split your design must have an intersection (remember what you learned about the intersection of sets at school? ), otherwise the alignment with the help of crosses will be impossible. Splitting a design: how and where? The main task of splitting a machine embroidery design is that the separating lines must not be seen when embroidering. Therefore, you should understand where it is better to split an object and whether it is possible to get along without splitting. Learn to split so as to hide the separating lines under the last embroidered objects. After splitting the design in your mind, proceed to do it in reality. Instructions on what splitting tool to use and how, you can find in video tutorials on Youtube. Having split the design, you now come to the next part: adding of the alignment stitches. Splitting a design: adding alignment stitches/crosses Some people prefer alignment stitches, some use alignment crosses. Both are utilities allowing you to quickly and within the accuracy of 1 mm join two designs into one project while rehooping. Recommendations on what tools and with what preferences you should use when creating the utilities for making the joining process easier, you can find on Youtube. Alignment stitches and crosses are always situated in the hoop intersection area and are present in both first and second parts of a design. In the first part of a design they are embroidered last, and in the second they are embroidered in the beginning. They must match together. If they match loosely, you should rehoop the fabric or change the design position in the hoop. If possible, place you alignment stitches and crosses where there will be no embroidery. If there is no such possibility, delete them after aligning. Splitting a design: saving After having completed the splitting you should save the result into two different files, which will be embroidered one after the other, and choose which one of them will come first. In our example, we embroider the body first and then the head. Is it clear, why? Because if there is a minor offset, Stitch's head won't look like it is incorporated into his body. Before saving your design delete the virtual hoops, because they have completed their task and you won't need them anymore. After this lesson you'll have 2 files as a result: Body. PES and Head.PES. Steps in these files go as follows: Body.PES: First, you embroider all the objects of Stitch's body, then the alignment stitches and crosses. Head.PES: First, you embroider all the stitches and crosses, and then all the objects of Stitch's head. Thank you for the embroidery design. However, is there a way for me to download the correct thread color. I download in "Art" format as I have a Bernina 830 but the thread colors are not the same as shown on your embroidery software. Should I download in a different format? I would appreciate your advise.